شرکت Promise Technology در سال 1988 و در ایالت کالیفرنیا آمریکا تاسیس گردید. این شرکت یکی از بزرگترین ارائه دهندگان راهکارهای ذخیره سازی در دنیا و مبتکر تکنولوژی Raid می باشد. این شرکت در زمینه ارائه راهکارهای ذخیره سازی به صورت Cloud و همچنین راهکارهای ذخیره سازی مختص سامانه های نظارت تصویری دارای سوابق بسیار موفقی می باشد. این شرکت توسعه یافته هم اکنون دارای دفاتر متعدد در دنیا می باشد تا بتواند مشتریان خود را به بهترین شکل ممکن پشتیبانی نماید. یکی از بهترین خدماتی که این شرکت برای مشتریان خود فراهم نموده است , ایجاد ابزار آنلاین محاسباتی برای راهکارهای ذخیره سازی با محصولات خود است تا مشتریان قبل از خرید بتوانند اطلاعات کامل و لازمی را از محصول در اختیار داشته باشند. Its All About Your Security! Whether property, assets, or even people’s lives, we at PROMISE understand that you sell security and in video surveillance security means 100% reliability. This can only be achieved by finding the right solution for the right customer. So, how do you ensure that you deliver the best packages? It’s a big question when dealing with a bewildering array of surveillance packages that include host recording systems like DVR or NVR, cameras, storage arrays and operating software with technical support. Smaller scale surveillance deployments require intact and remote access to the video archive with plug-and-play convenience. A smaller network storage appliance integrated with 3rd party video management software is the ideal choice. The Vess Appliance Series has onboard storage with enough potential storage capacity for smaller scale surveillance deployments with relatively few cameras. The Appliance Series is easy to install and requires minimal support, it’s perfect for small businesses or households. Medium sized surveillance networks with more concurrent video streams places bandwidth at the top of the priority list. High performance is essential to avoid live playback bottlenecks. A professional network storage appliance connected via direct attached storage, network attached storage or even a SAN device lock-up provides better extended data retention and throughput assurance for all application types at this level. 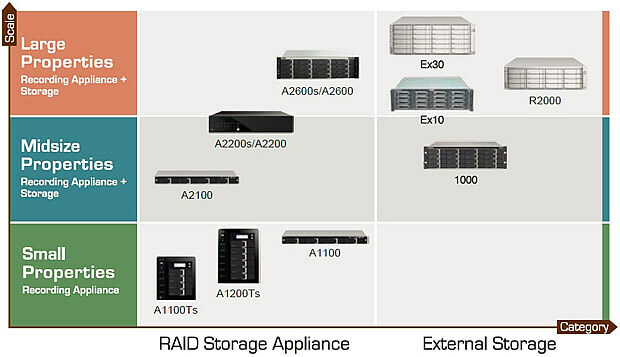 The Vess Appliance Series storage appliance and VessRAID systems are well suited to midsized surveillance networks. Large-scale installations for transportation, municipal, government or corporate surveillance needs require expansion flexibility, rock-solid reliability, cost-effectiveness, centralized storage management and onsite vendor support. Enterprise-level recording systems with scalable external storage capable of handling data from hundreds or thousands of cameras are used for these applications. Large external storage capacity, support for on-demand expansion, long retention periods, reliable and high-bandwidth throughput, and tech support to quickly solve any unexpected glitches in real time, are a must in high-level security environments where downtime is unacceptable. The Vess Appliance Series storage appliance and Vess/VTrak storage systems are designed to meet these demanding requirements.